The source of an infection linked to the deaths of heart surgery patients at an Edinburgh hospital has still to be located, ministers have revealed. Health Secretary Jeane Freeman said the infection had been caused by three different types of mould not normally found in hospitals. But the source of the moulds in the Royal Infirmary of Edinburgh has still to be identified. NHS Lothian has written to 186 heart surgery patients about the infection. They warned the patients about the potential risk of the unusual strain of heart valve infection known as endocarditis. A total of 26 patients have responded, 19 of whom have been passed on to their local health board "for further consideration". The fungal mould infection can take up to six months to materialise and patients have been advised of the symptoms. A review found six patients who were operated on had contracted an infection, with "a number" of these people subsequently dying. Four operating theatres were closed as a precaution to enable specialist cleaning, two of which have since reopened. 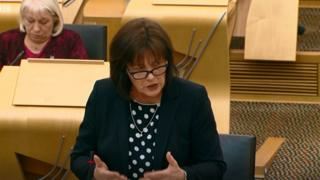 In a statement to Holyrood, Ms Freeman said: "I completely understand that for patients who have been contacted by the board this will have been a worrying time. But, let me repeat, the board were right to undertake a review of cases and inform patients they identified as a result of that exercise. "No patient wants to receive a letter similar to those sent by NHS Lothian last week. "But I hope that what I've outlined today provides reassurance that these letters form part of a proactive, precautionary infection control and risk management system here in Scotland. "Not all healthcare associated infections are preventable, but we do have dedicated professionals and a rigorous system, focused on limiting and controlling them. " In a response to a question from Green MSP, Andy Wightman, Ms Freeman confirmed that "so far the source has not been identified".